In 2010, we sponsored a challenge to find unique opportunities for philanthropic investment. 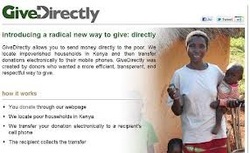 GiveDirectly, a start-up organization providing unconditional cash transfers via mobile phone, was the clear winner. We invested in their efforts and they have since achieved significant growth. This experience has inspired us to sponsor prize #2 in the hopes of finding another such initiative to nurture and invest. In 2010, we, a San Francisco-based family foundation sponsored our first online challenge to identify opportunities for philanthropic investment. The contest was devised as an experiment to find out if a broad, open call could uncover rare opportunities with huge potential, yet lacking access to alternative funding. The foundation partnered with the open innovation platform InnoCentive to seek submissions for an “Extraordinary and Unorthodox Philanthropy” challenge. Over 1,000 people signed up as “Solvers” to view the details of the challenge, resulting in nearly 200 submissions. From this pool, one clear winner emerged that met each of the criteria laid out in the challenge description. The winner was a start-up organization called GiveDirectly that was piloting the use of unconditional cash transfers via mobile phone to very poor households in Kenya. GiveDirectly was founded by a group of young economists that had discovered cash transfers as a promising development tool during their graduate studies at Harvard and MIT. Unable to find an existing cash transfer organization to which they could donate, they founded GiveDirectly as a vehicle to channel their own philanthropic dollars. See this article to find out more about GiveDirectly. GiveDirectly best embodied the spirit of the challenge in part because their model challenges much of the orthodoxy of international aid. The idea of unconditional cash transfers defies the convention that poverty is a problem to be solved by outside experts and that international charities are better positioned to allocate development funds than the poor themselves. Since our initial support, GiveDirectly has attracted millions of dollars in additional funding, including a $2.4 million Google Impact Award (read more here), and received a top rating from charity evaluator GiveWell. The success of the first challenge, and of GiveDirectly itself, has inspired us to sponsor a new prize to unearth another rare opportunity that is both extraordinary and devoid of funding. The intention is to find another initiative or organization for which our support might be catalytic. Our hypothesis is that there are individuals, perhaps in academia, the private sector, public sector, or elsewhere, that have big ideas but lack the resources or mandate to pursue them. Such individuals with unconventional ideas may not actively seek out philanthropic funding that is often organized around traditional issue silos. Our hope is to reach them and provide the spark and encouragement for them to bring their ideas to life. We pose no restrictions as to the nature or source of ideas. Some historical examples of opportunities which resulted in dramatic returns to society include: the conception and adoption of Oral Rehydration Therapy to treat dehydration, the development and delivery of insecticide-treated bednets to guard against malaria, and the growth of mobile money platforms that bring financial services to the unbanked.